In an era of increasing media fragmentation, you could describe the Super Bowl as the only annual media event where a substantial portion of the U.S. population gathers at the same time to watch the same thing: Over 100 million people tune in, and a good portion say the ads are the main reason they’re watching in the first place. For these reasons, the Super Bowl is the granddaddy of all ad buys. But in recent years, the tradition of millions of people simultaneously sharing the same commercial experience has become more complicated. As I discuss in my new book, advertisers are leveraging new technologies to track our personal habits and target us with individualized advertising. In other words, they want to make sure the ads we see are aligned with our existing tastes and preferences. It’s based on research showing that a “personalized” ad is more likely to stick in our heads and trigger a sale. This sort of thing happens when we receive direct mail based on the type of car we own. It happens in the supermarket checkout lane when our shopper’s loyalty card tells advertisers our purchase histories. It’s happening during the Super Bowl, too. And it may even change the way we see Super Bowl ads in the future. Journalists tend to make a sport out of Super Bowl advertising. Like the stock market, the prices of ads get analyzed. Like movie previews, teasers of ads for the big game are distributed and discussed before they air. And just like the game’s biggest plays, the ads get dissected afterward, with advertising experts breaking down which ones worked and which ones didn’t. Others recognize the collective nature of this event by characterizing Super Bowl ads as important reflections of the national spirit. Apple’s famous “1984” ad channeled the Cold War. Other ads notoriously captured the dot-com bubble of the late 1990s. Last year, various commercials were praised and critiqued for their implicit rebukes of the nascent Trump administration. But a Super Bowl ad doesn’t just end when its 30 seconds on TV are up; it creeps into our lives in ways you might not realize. By one estimate, 78 percent of Super Bowl viewers will engage with social media while watching the game. When they do so, they will supply valuable data for hungry marketers. When individual audience members share an ad or make a comment about one on Facebook, Twitter or Instagram – either during the game or after – those posts are tracked and cataloged. They become part of our digital profiles, auctioned off to the highest advertising bidder. Those who are more interested in the party or the game – but are nonetheless using social media – are still providing information that’s valuable to advertisers. 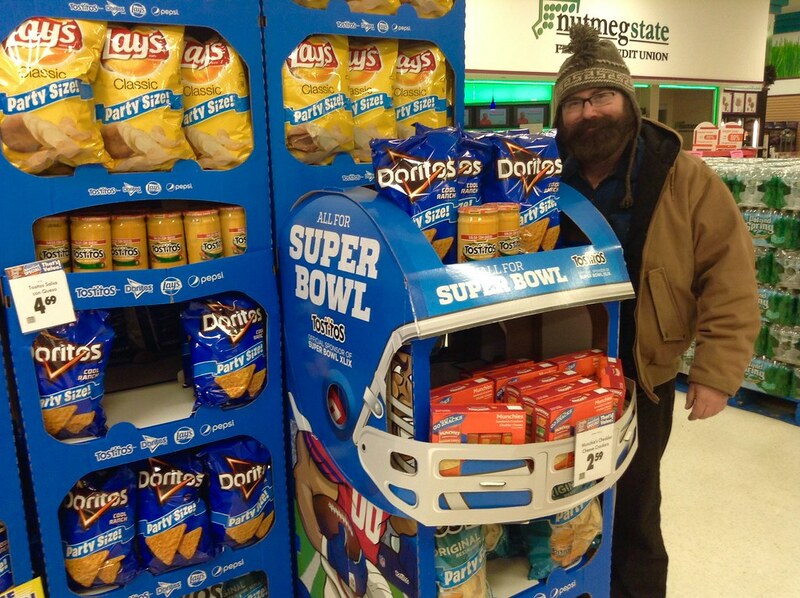 Even an innocuous Super Bowl party selfie can be mined for advertising gold. For example, Coca-Cola recently used an image recognition engine to identify people who posted pictures in which they appeared happy or excited with cans or bottles of their competitors. Coca-Cola then targeted these people with ads for their products on 40 mobile sites and apps. So if you’re holding a can of Miller Lite or a bag of Doritos, Budweiser and Pringles might take note. Image recognition engines can determine the preferred brands of users through the photos they post on social media. Perhaps the most startling form of market research going on is the commercial surveillance taking place inside our heads. Because there’s so much money riding on each Super Bowl ad – more than $5 million for each 30-second spot – advertisers want to make sure they resonate. It’s difficult to measure advertising effectiveness, so marketers have turned to brain science for an answer. For over a decade, neuroscientists have been scanning the brains of select Super Bowl viewers to see how they react to the commercials that air. Their studies purport to reveal the narratives and images that best capture the public’s attention in a way that postgame surveys of Super Bowl audiences cannot. This information can then be leveraged to develop more effective Super Bowl ads in the future. Just as the neuroscientists had hoped, strategically altering the ordering of the ads to fit these preferences increased audience attention. The ultimate goal of studies like this is to target viewers with personalized television commercials. Cable providers and television networks are bullish on using new technologies to deliver something called “addressable television,” the process of sending specific TV commercials to individual households. Personalized TV has already been used to target married women with children with ads for an amusement park and international fliers with ads for online travel. But addressable television need not be limited to showcasing particular products. Commercials could be customized to feature either a happy ending or a sad one, depending on who’s watching. If television becomes yet another site of individual targeting – like social media and online browsing – something will be lost. The Super Bowl, the event that seemingly brings the country together once a year, may become yet another media experience that cloisters us in our own digital bubbles. Image: Neuroscientists have been scanning the brains of select Super Bowl viewers to see how they’re reacting to the commercials that air.